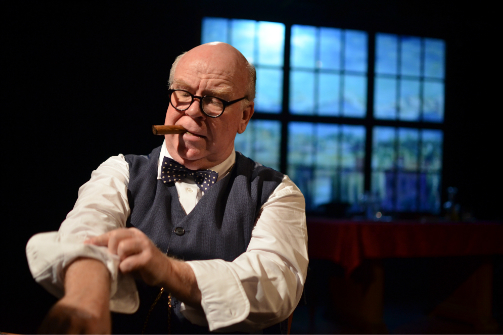 BOTTOM LINE: A solo show featuring Winston Churchill, his life, and his sense of humor. Winston Churchill was as much a fearless politician as he was a character. History has remembered “The British Bulldog” for his leadership, his inspiring speeches, and his biting sense of humor. Churchill’s expert command of the English language made his speeches as famous as his insults. In the American consciousness, his friendship with President Franklin D. Roosevelt and his overall adoration for the USA made him a beloved ally. It seems fitting, then, to have this solo set at Westminster College in 1946 when President Harry Truman invited Churchill (played here by Ronald Keaton) to make a speech. For those of you who may have slept through history class, or who simply were not raised surrounded by Churchill biographies (guilty as charged), Keaton’s performance offers plenty of context so that anyone can follow the man’s story. The play is set just before Churchill would make his famous speech “The Sinews of Peace” where he would coin the phrase “iron curtain.” Just a year prior Churchill finished leading Great Britain through World War II as its Prime Minister. As the play reveals, his journey to becoming Prime Minister was a long and not-always rewarding navigation through “the wilderness that is politics.” In fact, few people in his life thought he would ever have a successful career in politics, never mind becoming Prime Minister. He was mostly ignored throughout his childhood, and was often chasing shadows of his father’s political successes. In the public imagination Winston Churchill is often thought of as a charismatic yet stern, often times lonely, man. Since WWII he has been described as a pillar of unwavering strength. Yet, Keaton’s interpretation is vulnerable and warm. His mere presence on stage is inviting, as if he just wants to sit with us over a good whiskey and have a conversation (and, perhaps, brag a little bit, too). I will allow the historians and Churchill aficionados to argue over whether Keaton’s portrayal is truly accurate. Underneath the praises of this powerful leader was, simply, a man. Keaton’s ability to show us a strong, witty, yet vulnerable leader is, frankly, a relief. Ronald Keaton is best known in the Chicago theatre scene as a character actor, especially in musicals. To some this production may come as a surprise. But, Keaton rises to the challenge with a similar conviction as the character he embodies. To play a larger-than life figure, and to play him convincingly, for two hours alone on stage is a monumental achievement. Perhaps Keaton’s most extraordinary asset is his stamina; surely the performance was exhausting, yet at no point does Keaton’s energy waver. For every minute of this performance he is Churchill. I particularly enjoyed the clever use of the backdrop to elaborate on the story. The screen(s) behind Keaton show different images that relate to his various life chapters. It helps to put faces to the various names he knew, and it sets the mood for whatever ordeal he is retelling. I do wonder if certain famous quotes are injected into the play for the sake of having those quotes; sometimes they seem to come from nowhere. Nit-picking aside, Keaton’s performance is powerful. I would encourage history buffs and history novices alike to see this production. If you are suspicious of Keaton’s interpretation of Churchill, at the very least his performance provides interesting food for thought at your post-show dinner.